This note is from BI Research, a new tech-industry intelligence service. The service is currently in beta and free. To learn more and sign up, please click here. Amazon’s Kindle is no longer just a product: It’s a whole ecosystem. Specifically, it’s not just an e-book reader but a tablet, a media store, a platform for digital media sales, and even a publishing imprint. The Kindle ecosystem is also Amazon’s fastest-growing product and could account for more than 10% of the company’s revenue next year. How does Amazon generate revenue from the Kindle ecosystem? Does it generate any profit yet? Will it ever generate profit? Answering these questions is complicated because Amazon discloses little (basically nothing) about the Kindle ecosystem, and because the business is still so new. 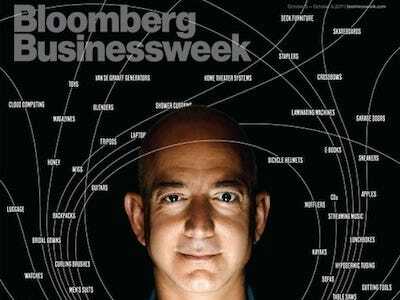 But the Kindle is extremely important to Amazon’s future, so we need to work with the information we have. That being said, it’s probably a big business. 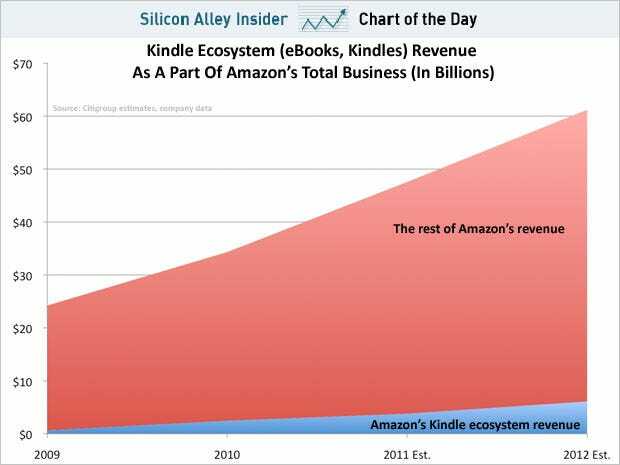 Citi analyst Mark Mahaney estimates that Kindle ecosystem revenue will be 10% of Amazon’s total revenue by 2012, a $6 billion business (see chart at right). Most analysts agree that Amazon probably sells Kindle hardware at breakeven or a small loss to subsidise media sales, thus employing the famous “razor/razor blade” model. As it gains in scale and efficiencies, it passes savings on to the customer, achieving very low price points (see chart). We believe Amazon is almost certainly losing money on its newest and highest-end Kindle, the Kindle Fire. It’s probably closer to breakeven on the other Kindles, according to analyses we’ve seen. So the Kindle hardware business probably generates several billion dollars of revenue, but, at best, Amazon probably breaks even on these sales. So, what about the software–media? The economics on each of these is different, so it’s worth briefly addressing all of them. Digital books: Amazon started out by selling losing money on e-book sales by adopting the “wholesale model”: buying books from publishers at regular print wholesale prices and then selling them at a discount to set reader expectations of a lower price for e-books. The publishers freaked out about this, though, because they thought it would cannibalise print-book sales. (Which is inevitable, but that’s a different issue.) Amazon lost a high-profile battle with publishers, and agreed to move to an “agency model” where publishers set the prices of e-books and Amazon gets a commission, which is probably small. Publishers typically price e-books at the same price as paper books. So Amazon probably doesn’t make a lot of money from these sales right now. But it’s also probably not losing as much money as it was. One day Amazon will make more money from Kindle books, though, in part because it is becoming a publishing house. Amazon already lets authors self-publish books on the Kindle platform, where it keeps 30% of the price. Some authors have already become millionaires by side-stepping traditional publishers and selling smaller books for lower prices and increasing volume. Amazon has also opened its own publishing imprint, hiring New York editor Larry Kirshbaum to head it and compete head-to-head with traditional publishers. Amazon doesn’t just publish these books on Kindle, but also as paper books, selling them on its website. Self-published and Amazon-published books are still likely a small part of all the ebooks sold, but they’ll likely grow. And as Amazon moves up the value chain in publishing, as the possibilities of self-publishing on Kindle draw more and more writers to side-step the traditional publishing process, and as Amazon gains additional negotiating leverage over publishers, Amazon should make serious money from e-books. All in all, the number of ebooks available on the Kindle platform is growing fast, getting close to a million, according to Citi’s Mark Mahaney (see chart at right).This is a bullish signal on the Kindle ebook platform, because we believe it has network effects: as the Kindle becomes the dominant sales channel for books, it will attract more consumers, which will attract more publishers/authors, which will attract more consumers and so on. And this, in turn, will increase Amazon’s negotiating leverage. Eventually, publishers will become so dependent on Amazon for distribution that they’ll have to give it better terms. Amazon MP3: Amazon probably doesn’t make money on music sales yet, either. Amazon MP3s tend to be lower-priced than Apple’s, because Amazon has a much lower marketshare and attracts customers with aggressive pricing. Amazon Instant Video probably doesn’t make much money either. Amazon Instant Video is part of Amazon Prime, Amazon’s $79/year, two-day free shipping program, and is included at no additional cost. Amazon Instant Video is part of Kindle Fire, but non-Prime subscribers will still have to pay to rent or buy the content. Apps are also probably profit-free at the moment. Apps have never been a big moneymaker for other mobile platform owners like Apple and Google, and they probably won’t be for Amazon. And then there is advertising. Some Kindle devices now come with ads. Right now, Amazon probably doesn’t make money from ads either, because it sells ad-free Kindles for more. Amazon should, however, make money from Kindle ads over the long run for a simple reason: it has a monopoly on them. Kindle ads now include ads for Amazon Local, Amazon’s daily deals product. More generally tablets are just a big canvas for advertising creatives to play with, and Amazon knows a lot about Kindle owners, which means advertisers should be willing to pay a lot of money for Kindle ads. Ads: Some, probably small at this point. So if Amazon isn’t making any money on the Kindle ecosystem, why did Amazon get in this business to begin with? Amazon will probably make money from the Kindle ecosystem eventually. Right now, Amazon generates 45% of its revenue from the sales of physical media–books printed on dead trees, DVDs and the like. This form of media distribution is, slowly but surely, going the way of the dodo bird (or at least the tiger). No one knows when, no one knows how, but it’s happening. Amazon has to lead that disruption, instead of being disrupted by it. Books are a great example. 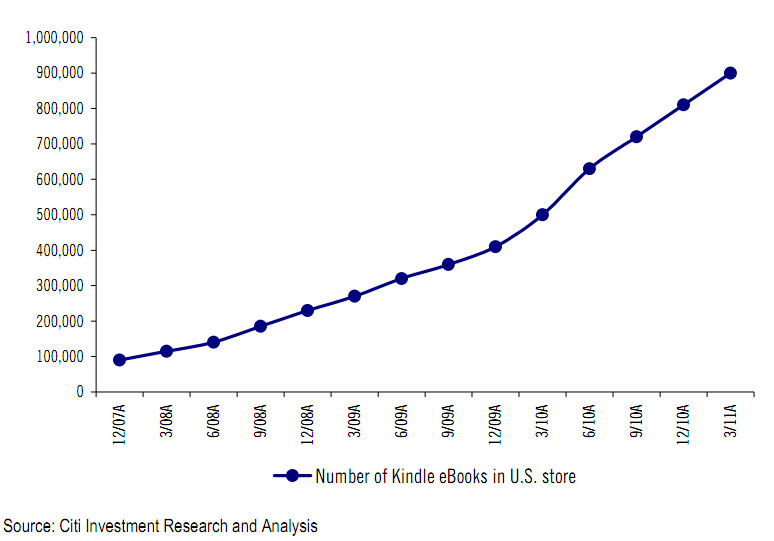 With the original Kindle, Amazon pioneered the sale of digital books, and as a result owns over 90% of their distribution. Amazon may not make much money from digital book sales now, but it’s certainly in a better spot to make money from it eventually than if digital book distribution was controlled by Sony, Barnes & Noble or Apple. The same thing is true of music and movies, where Amazon is playing defence against Apple and Netflix: Amazon simply needs to have its own distribution channel for these kinds of media in order to not be displaced, even if it’s not making money right now. And this is where the second point comes in handy: Amazon will probably make money from the Kindle ecosystem at some point. A few short years from now, Amazon will be able to sell media tablets with better specs than the Kindle Fire, profitably or at breakeven, for $99. And once people use these tablets, which feature Amazon’s media offerings and an Amazon-mediated web through its revolutionary browser Silk, this will drive a lot of incremental sales of both physical goods and media. So it’s easy to see how Amazon will make money from books and ads over the long run. But if Amazon gets millions or tens of millions of cheap media tablets in the market it will also be very well placed to make money from other kinds of media, as it will have the kind of distribution that will allow it to get better deals with content owners. One thing to remember about Amazon is that it is very comfortable operating in a margin-constrained environments and wins by passing savings to consumers. If the Kindle ecosystem grows thanks to low prices and has, say, 5% profit margins overall a few years from now, for Amazon, that’s good. If one thing is true about Amazon, it’s that it thinks long-term. The company’s core commerce business wasn’t profitable for seven years. Now it’s wildly profitable. Amazon began offering cloud services in 2002. Now it’s one of the leaders in the sector. Kindle is a decade-long investment in a media consumption and distribution ecosystem. It’s something Amazon can’t afford not to do because it needs to disrupt itself. And it’s something that can pay off hugely down the road. 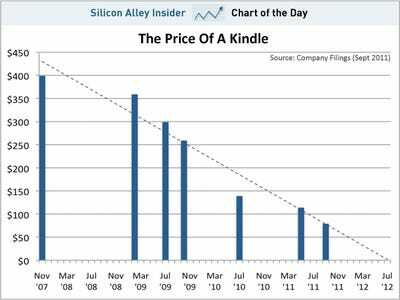 So Amazon probably won’t make any money on the Kindle ecosystem today, or next year, or even for a few more years. But it’s still a brilliant long-term investment. This note was published as part of BI Research, a new industry intelligence service from Business Insider. The service is currently in beta and is free. To learn more and sign up, please click here.